Ali and Katya are as one. You just have to ask – just why he should care? All quite hard to believe. I never imagined, when we won the vote, that so many would spend so much of their lives doing their utmost to complicate a simple act thereby confusing and terrifying the populous. But there it is and as they discuss exiting the EU or bits of it or not leaving at all, I am ashamed of my country and a significant number of of it’s people. gaxvil, I am forced to conclude it is a form of possession, bordering on the Satanic. Either that or being willing to be oppressed by a spirit of fear and then to deliberately oppress others in the same way. That point marked the availability to the whole world of the liberation from the law of sin and death. “Do not be afraid!” Ever since people have been discovering a personal liberation from that which kept them bound up as prisoners. Home sec Javid announces new stop and search powers. How long before the beeb have lib-left guests on their news shows to bleat about the move being racist? There’s talk of an election and some Tories fear they will lose. Good. Let’s have an election, and pray that Treezer is the leader. GWF, I think all would lose. The Tories will lose many Remainer MPs. Corbyn & McDonnell will have to resign after Labour are decimated. Labour cannot escape the Remain label now. (It will be interesting to see if and how the BBC try to rescue them!) Some of the Change Party may well lose their seats so their new leader, Heidi Allen, will probably have to go. If Labour and the Conservatives do well again in Scotland that might be the end of Sturgeon. I don’t think she could take another heavy loss. Cable is going anyway from LibDems, so any interim leader might not fare too well. The Greens might fare well. The problem will be for UKIP and the new Brexit Party. Will they split the anti-EU vote? They could hold the balance of power with the DUP if UKIP and Brexit Party both get half a dozen seats. Could be an interesting Parliament. Government formed from the rump of Remain Conservatives + Brexit Conservatives + DUP + UKIP + Brexit Party. I’d rather not go there. Up2 – I disagree with that point – I’d want to see the whole lot lose – except for the very small number ( now ) who have stuck to the leave guns . The rest can rot . I’d just hope ( on a small point ) that they’d kick Bercow out and down and no gong …. As a right winger I favour small governments which can’t do much to screw the lives of individuals they really don’t care a damn about unless there is a career advantage . If the conservatives cannot read the mood in the country outside their bubble they don’t deserve to survive …. Fed, it would be great to think that all voters who favour democracy over all the other options would vote out all of the 400+ Remainer MPs but I think we have to accept that will not happen. I, too, favour small government and would like to see a truly small ‘c’ Conservative Party rise from the ashes; less social liberalism, more social liberation along with a healthy dose of grown up responsibility on both part of government and people. Suspect I’m rather more of a centrist than your good self but many then would paint me as a bit of socialist. I don’t think any polling outfit could be accurate on that …. – Worried about not being able to sell their breeding sow meat to Gemany . 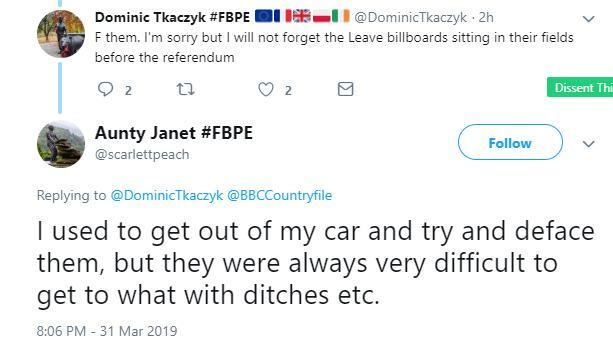 Remainers on Twitter shout BBC bias cos a Leave family were allowed on at all. I take it there was no mention of the continued use of antibiotics on chickens …. not as colourful as ‘clorinated chicken ‘ but probably far worse for humankind ….. 250 tonnes of the stuff used last year if I heard the news right …. The reason why that news exists today is cos there was a “Countryfile investigaton”, so it was a focus of today’s programme. Note that we humans use tumeric and honey, with antibiotic properties but don’t class them as antibiotics. I wish to report about an ongoing Countryfile investigation into evil Market Gardeners poisoning plants by pumping carbon dioxide gas into Greenhouses so as to warm up the Greenhouse with Greenhouse Gases, therefore killing tomato plants by poisoning and frying them inside the Greenhouse. This was my first attempt at an April fools joke, but the BBC’s left-wing morons and schoolchildren reading it, could not possibly believe that the above was a joke. Due to the Monmouthshire, Berwick, Pimlico and Kingston upon Hull Act of 1746. Monmouthshire in Wales, Berwick-upon-Tweed, Pimlico in London and Hull in Yorkshire have accidentally left the European Union on Friday due to an error by the idiots in the Civil Service leaving out this Act of Parliament from the Article 50 extension documents. Screams of great happiness have been heard near Hull. I can confirmation that this is NOT Fake News because its April the first.